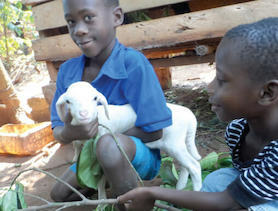 Can livestock change a life? For Madam Assibi, two goats and a sheep was all it took. Madam Assibi started with just two goats and a sheep. What difference does a goat or sheep make for a family? Just ask Madam Assibi. Madam Assibi Akanpie lives in Yebongo, a community in the Bolgatanga Municipality in the Upper East Region of Ghana. Bolgatanga is famous for its beautiful hand-woven baskets, and Madam Assibi is a proud basket weaver herself. For a long time, it was her main source of income. But on its own, her basket weaving income wasn’t enough to provide for her six children. 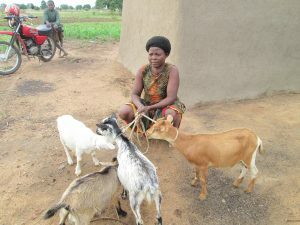 Feeding her children nutritious food, especially during the dry season, was also a problem. She worried about their health. With her children’s future in the balance, Madam Assibi needed a new way to provide for her family. She decided to try out a livestock program that she’d heard about in her community. 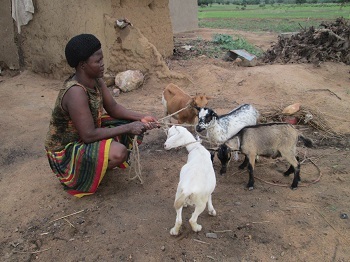 Madam Assibi joined the small ruminants (livestock) program run by CFTC partner TradeAID. 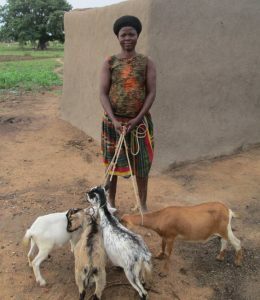 She received two goats and one sheep and completed training on their housing, diet and veterinary care. As Madam Assibi took us on a tour of her family farm, it was obvious that she takes great pride in caring for her animals. She walked us through the ways she keeps them healthy, including building them a spacious, airy pen that she keeps spotlessly clean. It’s a comfortable home for her animals, and the ventilation and cleanliness reduces the chances of the animals catching illnesses. She takes other important steps for their health as well. Day to day, she makes sure that they are fed appropriately in all seasons. During the dry season when the grazing grasses dry up, she supplements their diet with feed like groundnut and bean vines. The result? Healthy animals – and a healthy family. 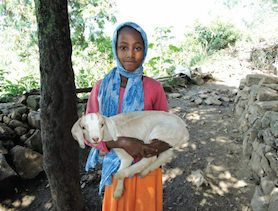 Madam Assibi’s goats and sheep are providing a sustainable income for her family. As Madam Assibi’s goats and sheep grew and multiplied, so did the opportunities for herself and her children. After a few months, Madam Assibi successfully bred her animals and sold a few for profit. With the money she earned, she was finally able to put enough good food on the table for her children. Madam Assibi is proud of the technical expertise she’s gained through her new livelihood. Her goats and sheep now serve as the assets she needs to access credit and grow her business, and she feels empowered to take the next steps. Her plans include increasing her herd and selling more livestock. 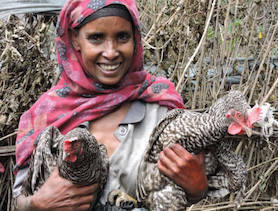 She’s also keeping abreast of improved animal rearing techniques and paying close attention to the market. She hasn’t forgotten her first love. She is now buying straw and dyes for basket weaving to supplement her income. As Madam Assibi reflects on her thriving children and growing business, she’s thankful for the opportunities she was given – all because of two goats and a sheep. Three chicks grow up to lay 1,000 eggs a year – a reliable source of food and income that families can count on. Sheep are a hardy source of protein and profits become essential assets that bring in sustainable income for families.